Organically Beautiful: Goldenseal - The Wonder Root! Goldenseal - The Wonder Root! A main question many people have when switching shampoos, is "is this product safe to use on colour treated hair?" BlackBox Cosmetics' VuDu hair products are indeed safe to use on colour treated hair. One of the ingredients that helps make this statement a reality is Goldenseal Extract. Until I started using these products, I had never heard of this before, and had no idea what Goldenseal actually was... so being of the curious type, I thought I would look into it, and here is what I found. Goldenseal (Also known as Indian Turmeric) is a herbal plant, but from what I have come across, the flowers and leaves on the plant or essentially useless; the roots however, seem to do nearly everything! Once I found out that Goldenseal is the same thing as Indian Turmeric, I realized I did know what it was, but I only ever used it as a culinary spice, so was surprised to learn about all of the other benefits that Goldenseal provided. Aside from adding to a dish for flavor, goldenseal is also a natural astringent - which can be used as a toner and tightener on your skin, as well as a disinfectant - which can be used on cuts and scrapes. 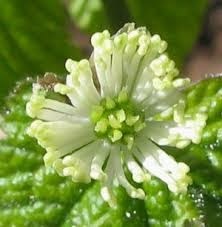 Goldenseal can be used to heal allergies, the flu and the common cold, and is also an anti-inflammatory. It can be used to improve your immune system, and has also been used to protect against cancers. It has also been shown to improve hair health, and to help prevent dandruff. It didn't take me long to figure out that this was an incredible plant! It has been used for thousands of years for it's medicinal properties, and many more people are learning about it now to include in their current lifestyles. BlackBox Cosmetics includes Goldenseal extract in some of their products - including VuDu Shampoo and Conditioner, and I can now see why. A disinfectant, anti-inflamatory, hair-health-improving, anti-dandruff, natural herbal extract, sounds like an ingredient I want to use in all of my beauty and health products!